New digital marketing trend set to hit Gloucestershire? The latest subject thats being heavily talked about in the digital marketing World online is the suggestion from SEO boffin Andrew Hagemann that Google is in the process of testing out a new search result system. 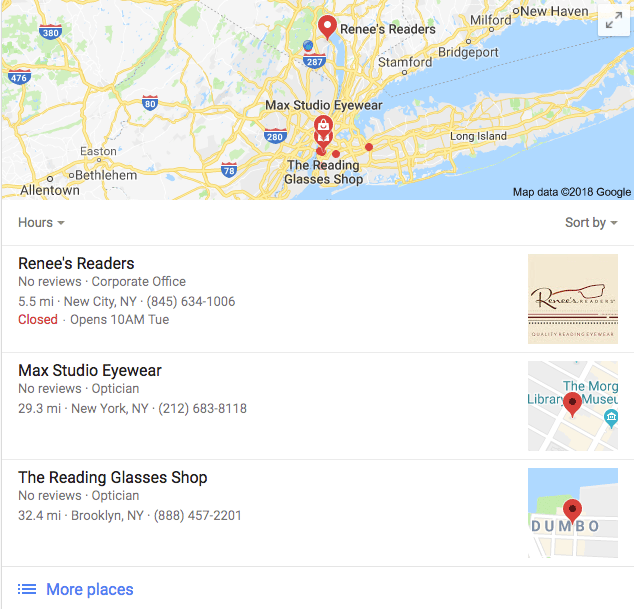 If you search for something like say 'reading glasses' you will traditionally be shown a standard search result alongside local suggestions based on your geographical location of where you can purchase the said glasses. Note the important element that Digital marketing experts are discussing is the fact you have are shown the 3 separate locations that you can visit to make the purchase. In standard Digital Marketing the 'SERP' would follow a simple, straight forward format and be shown like this image. Unlike the standard search result the newer version that its believed is currently (2018) in a testing phase, displays the geographical results in a linked structure that has all 3 local results grouped together. Instead of appearing in a list as per the standard search format they are now displayed once the arrow/tab is clicked on. What format do you prefer? Will your Gloucestershire website soon be showing in local search results in a new local format or will Google decide to stick with the current system? Mushroom Internet are Gloucestershire based digital marketing and website development experts and although located in the Cotswolds we are ideally based to enable customer from across the UK to raise their online profile and of course design a great website. Our services also include full hosting and domain name management. If you're interested in talking to use in more detail about anything relating to your website and its online presence (including social media management) please do get in touch with our digital marketing director.